The game of "yarn chicken" is begun when you can either see or imagine the end of your project and can similarly do the same for your yarn. Which will come to an end first? Will you get to the last bind-off, or will you fall three yards short...? 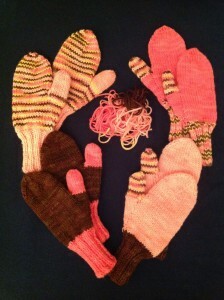 This four-pair mitten project was my first real game of yarn chicken. And, depending on how you look at it, either I lost or I won only due to creative rewriting of the rules. I started with 1 ounce each of four colors. 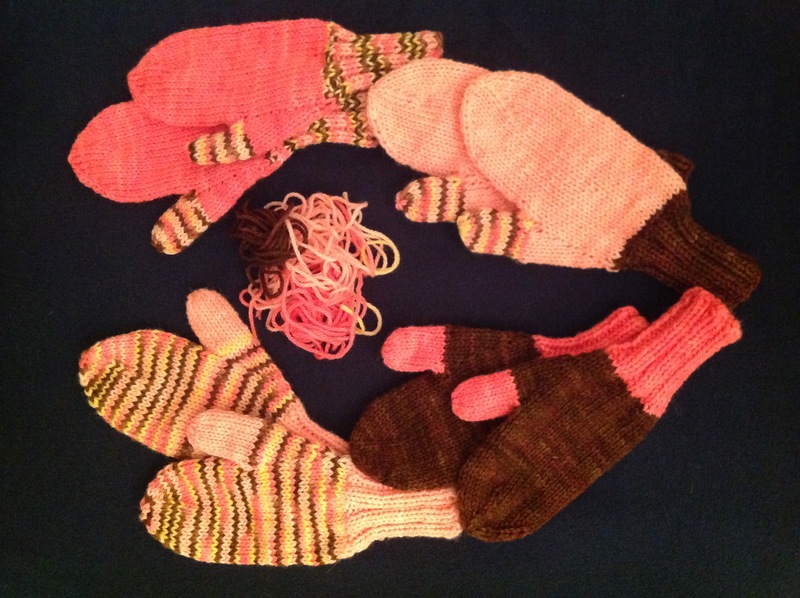 I wound them into two, hopefully-matching 1/2-ounce balls (which I measured out on the kitchen scale) to spread evenly over the pairs of mittens. I did not swatch or even do any math to be sure that I actually had enough yarn for the pattern; I just dove into knitting. My mittens are all supposed to be bi-color. One color was for the cuff and thumb, the other color was the hand. But look closely at this picture, and you can see that one set of mittens has three colors - the thumb does not match the cuff. Apparently the brown yarn was a smidge heavier for its length than the other colors, and ran out sooner. The pile of yarn in the center of the picture is everything I had left at the end, including trimmings and nerdles. It was certainly interesting to do! I fell in love with the bundle of yarn at SVFF, and I had just seen this pattern go by on AmazonMink's Ravelry page. I don't think I have had a project "speak" to me in quite that obvious a way since I did my hand spun wool hat so many years ago.